On Tuesday, US President Donald Trump and North Korean leader Kim Jong Un will shake hands for a photo-op unimaginable only a few months ago. Donald Trump had previously referred to the North Korean leader as a "madman with nuclear weapons". 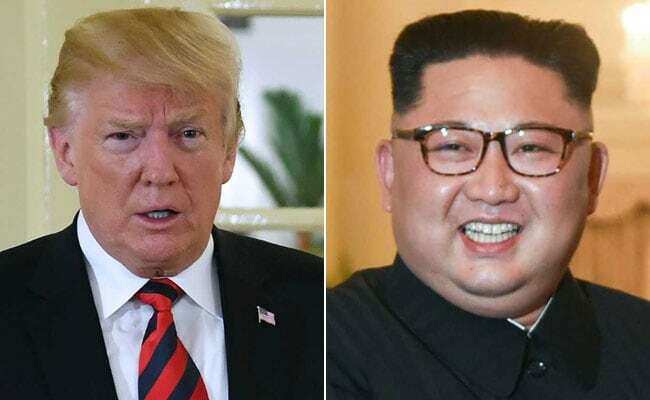 Singapore: On Tuesday, US President Donald Trump and North Korean leader Kim Jong Un will shake hands for a photo-op unimaginable only a few months ago. The nuclear-armed pair have hurled personal insults at each other that would not be out of place in the playground. Here are a few of the more memorable slurs. Kim had people around the world reaching for the dictionary when he called Trump a "mentally deranged US dotard", saying he would "tame" him with "fire". The insult, equivalent to calling Trump an "old lunatic", was a response to Washington's threat to "totally destroy" North Korea and came at the height of the war of words between the two foes. According to online dictionary Merriam Webster, searches for "dotard" were "high as a kite" after the comments hit the headlines. It appeared that the 71-year-old Trump took offence not at the allegation of insanity but rather the dig at his age. In response to the "dotard" insult, he took aim at the North Korean leader's physical dimensions. "Why would Kim Jong Un insult me by calling me 'old,' when I would NEVER call him 'short and fat'?" he tweeted. In an editorial, the North's ruling party newspaper Rodong Sinmun said that Trump had "malignantly hurt the dignity of the supreme leadership", and was "a hideous criminal sentenced to death by the Korean people". In his debut speech at the United Nations last September, Trump derided Kim as a "rocket man" on a "suicide mission for himself and for his regime". Doubling down on his insulting language, he referred to Kim as a "sick puppy" on the heels of an intercontinental ballistic missile test by Pyongyang in November. Trump had previously referred to the North Korean leader as a "madman with nuclear weapons". In his "dotard" statement in response to Trump's UN speech, Kim also said: "A frightened dog barks louder." It was not the only time North Korea has adopted canine references to describe Trump's statements. After the US president noted his nuclear button was "much bigger and more powerful" than Kim's - "and it works" - Pyongyang branded the outburst the "bark of a rabid dog". Not a personal insult, but one of the most intimidating of Trump's threats came in August after US media reported Pyongyang had successfully miniaturised a nuclear warhead to fit into a missile. "North Korea best not make any more threats to the United States," said Trump, his arms folded in defensive and bellicose body language. "They will be met with fire and fury like the world has never seen." In response Pyongyang said it was considering firing missiles towards the Pacific US territory of Guam.